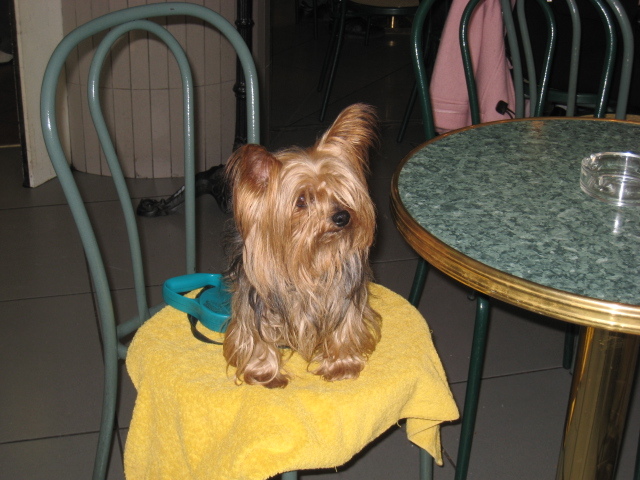 This little Yorkie was sitting outside the bakery by Carrefour, the supermarket in Fontvieille, Monaco, sharing a table with a handsome, brawny young man. When I asked if I could take a photograph the young man got up so fast he nearly knocked his beer over. Perhaps a famous footballer? I didn't know who he was, but he was very keen not to be photographed. No matter, a cute dog. Note how he travels with his own yellow towel to cover wherever he sits. Very correct. When I walked past later, the dog was still on the chair, but standing on his hind legs, his front feet on the table. I didn't like to ask if I could take another photo.